Tarsal Tunnel Syndrome is a painful foot condition which typically affects people who a lot of time on their feet. It is also known as TTS or posterior tibial nerve neuralgia. It develops when the tibial nerve gets squashed as it passes through the tarsal tunnel at the ankle, similar to carpal tunnel syndrome of the wrist. Anything which occupies space in the tarsal tunnel including cysts and swelling from ankle injuries can compress the tibial nerve. Tarsal tunnel syndrome causes pins and needles, numbness and pain on the bottom of the foot. These symptoms may extend from the heel to the big toe and adjacent three toes. Treatment for TTS aims to reduce foot arch pain and usually consists of rest, exercises, compression bandages and steroid injections. The tarsal tunnel is a narrow space found on the inner side of the ankle. It sits just below the medial malleolus, the protruding bony lump on the inner side of the ankle, between the ankle bones and the flexor retinaculum, a strong, fibrous band that attaches to the inner ankle and heel bones. A number of nerves, blood vessels and tendons pass through the tarsal tunnel, including the tibial nerve. Tarsal tunnel syndrome is a nerve compression injury caused by pressure on the posterior tibial nerve. 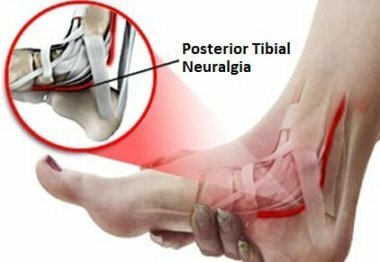 Anything that increases the pressure in the tarsal tunnel can cause posterior tibial neuralgia. 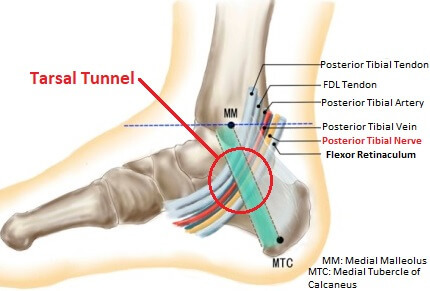 The flexor retinaculum cannot really stretch, so anything that takes up space in the tarsal tunnel can squash the tibial nerve. This reduces the blood flow to the nerve which leads to tarsal tunnel syndrome. In approximately 30% of cases of tarsal tunnel syndrome, the cause is unknown. Typical symptoms of posterior tibial nerve compression tend to be felt on the inner side of the ankle, underneath the foot and into the toes. In severe cases, symptoms may also be felt up the back of the calf to the knee. Pain: typically a shooting or burning pain on the bottom of the foot. May extend from the medial malleolus, through the heel and underneath the foot to the inner four toes. The pain typically eases with rest and worsens with activities such as standing, walking and driving. 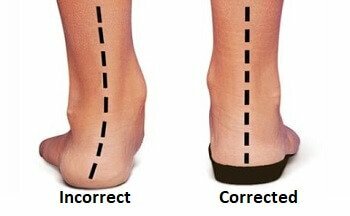 Orthotics: supportive shoes or specially designed inserts for your shoes can help to correct foot position by supporting the foot arches. In most cases, tarsal tunnel syndrome will resolve using a combination of these treatments, sometimes in as little as two weeks. The earlier TTS treatment is started, the quicker symptoms will resolve. If posterior tibial neuralgia is left untreated for a long time, it can cause permanent nerve damage, so early diagnosis and treatment is key. Occasionally, tarsal tunnel syndrome fails to resolve with conservative treatment. If symptoms are severe then surgery may be advised, known as Tarsal Tunnel Release or Decompression. Tarsal tunnel surgery typically takes up to an hour and in most cases you can go home later the same day. During tarsal tunnel decompression surgery, the flexor retinaculum is first released (cut) and then the area is fully inspected. There are three other tunnels in the area, the superior, inferior and medial calcaneal channels which may also be released. Any abnormal growths e.g. cysts or scar tissue are removed and any fibrous bands that are placing pressure on the posterior tibial nerve are released. Following Tarsal Tunnel surgery, your foot may initially feel numb. You can get up and walk within a few hours but you may need crutches or a frame initially. In some cases your doctor may limit the amount of weight you can take through your foot for a few days/weeks and you may be given a special boot or cast to wear. A physical therapist will go through a range of mobility and strengthening exercises with you, and will guide you through your rehab programme. You may also have a course of hydrotherapy (aqua therapy). After a week or two you should be walking normally without any aids, and any stitches will be removed after 2-3 weeks. At this point you can usually start driving, but you must be able to safely perform an emergency stop. People with sedentary jobs usually return to work approximately 4 weeks after tarsal tunnel surgery, but if you have a manual job it is usually best to wait around 6 weeks. Tarsal Tunnel Surgery has advanced recently and when all four tunnels of the medial ankle are released as part of the surgery, then there is a success rate of approximately 85-90%. There are a number of other conditions that cause pain on the bottom of the foot. You can find out more about these in the foot arch pain section. Alternatively, if you want some help working out what is causing your foot pain, visit the foot pain diagnosis section.